First initial of mark may be T. Sharp fins. No drop, but a shaped ridge there. Length 8-7/8". Weight 1.4 troy ounces. 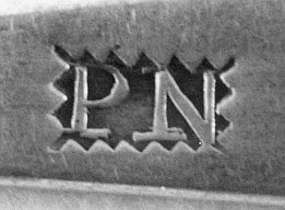 Lengthwise script monogram N.Parsons. Overall condition excellent. Mark condition very good (initial rubbed). Is this Thomas Ireland of Boston? Form seems too early for him. Very distinctive handle which flares at end. No drop. Length 8-7/8". 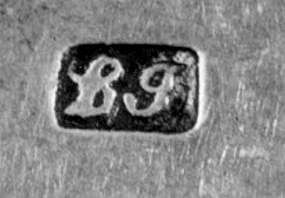 Weight 1.2 troy ounces. Monogram is a single letter - S(?). Overall and mark condition are excellent. Downturned handle, fiddle, sharp fins. Crescent roulettework incised drop. Length 5-3/8". The monogram is a lengthwise script ME. Overall and mark condition are excellent. Downturned handle with oval end, tipt. V drop. Length 5-1/2". 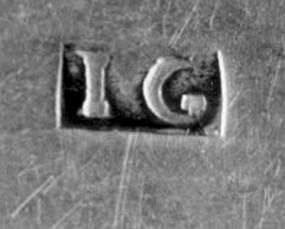 The monogram is a lengthwise script EM in an oval reserve. Overall condition is very good. Mark condition is good. Downturned handle with oval end, tipt. V drop. Length 5-1/4". Lengthwise script monogram AL. Overall and mark condition are excellent. Downturned handle with oval end. Bright cut. Wide V incised drop. Length 5-9/16". 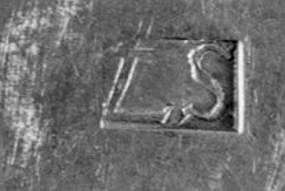 The monogram is a lengthwise script SSC (or possibly SH). Overall condition is excellent. Mark condition is good (the W is rubbed). Bright cut. Downturned handle with coffin end. No drop. Script monogram TCS? Overall condition is very good (some tip wear). Mark condition is excellent. 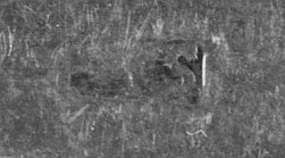 Listed in Flynt & Fales as an unidentified mark. Bright cut. Downturned handle with oval end. Long drop with crescent slash. No monogram. Overall and mark condition are excellent. Marked twice. A lovely spoon. Downturned handle with rounded end, drop. length 5-1/2". No monogram. Overall condition is good (some tip wear). Mark condition is excellent. Downturned handle with pointed end, no drop. Length 5-1/2". 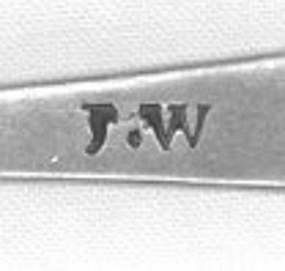 Sprigged script monogram MW lengthwise. Overall condition is excellent. Mark condition is very good. 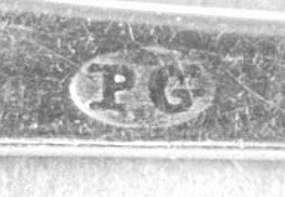 The mark is near the end of the back of the handle. Downturned handle with semi-pointed end, no drop. Length 5-7/16". 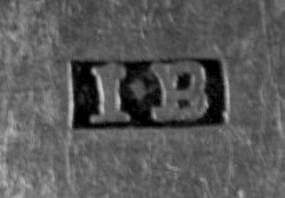 The monogram is a block T/B:S. Overall condition is very good (minor cuts in bowl); mark condition is excellent. Not by a big-city silversmith. 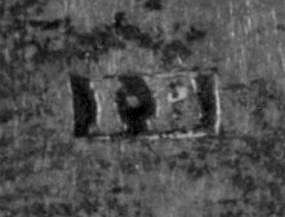 Darling "New York State Silversmiths" shows this mark as 'location unknown'. Downturned handle with oval end, tipt with light midrib, drop and worn shell. Length 5-3/8". The monogram is a script JEC. Overall condition is very good (shell severely worn). Mark condition is good.